L.A. Banks is the pseudonym of Leslie Esdaile Banks. She wrote paranormal urban fantasy. You can read excerpts of her novels at the Vampire Huntress website and the Crimson Moon website. Manga and young adult versions of Vampire Huntress are available. 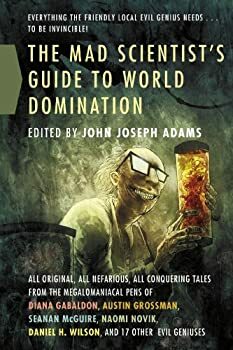 In the interest of accuracy, let me note that the edition of Minion that I have is the “Special Huntress Edition.” This is a sort of “director’s cut” that contains scenes not in the original edition of the novel. I have not read the first version and do not know which scenes are new. 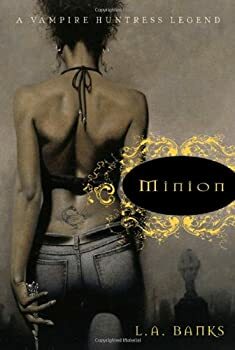 Minion tells the story of Damali, a young African-American woman, and her friends, who together make up a rap band and, secretly, a vampire-hunting team. Damali has been chosen Buffy-style as the champion of Light against the forces of Darkness, and her friends are the Guardians sworn to protect her until she comes into her full powers. There is a second plot as well, dealing with Damali’s ex-boyfriend, Carlos, who was once a Guardian candidate but has fallen into a life of organized crime. Fallen Angels — (2011) Publisher: The first in a spellbinding new urban fantasy series about fallen angels from New York Times bestselling author L.A. Banks. Celeste Jackson’s life has been a series of tragic occurrences. Haunted, the thirty-three-year-old woman has bounced from therapists to group homes, to drug halfway houses. Plagued by nightmares and hallucinations and misdiagnosed as schizophrenic, she is found by the angel Azrael — her protector. But as Azrael helps her to unlock her powers, and they work to amass an army of those with powers like Celeste’s in order to fight the forces of darkness, Celeste has as much to teach Azrael as he has to teach her. She’s been down the path of temptation and addiction. Now she must help Azrael overcome the one temptation that could make him an eternal prisoner — his addiction to her. The angel Azrael has been sent to earth in a human body, with a very important mission. He must find Celeste Jackson, a woman who is one of the Remnant, the last remaining descendants of angel/human couplings in ages past. The Remnant must be gathered so they can lead the human race when all hell breaks loose in 2012. When we first meet Celeste, she’s an unlikely leader. Labeled “crazy” all her life because she sees demons, she has fallen into an abusive relationship and heavy drinking. 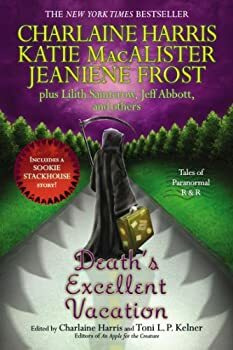 One night she’s sure it’s over — that her boyfriend is finally going to kill her — but instead he is killed by the demon that has been inhabiting him. Celeste escapes the demon but finds herself lost and hopeless, until she meets a drop-dead gorgeous man who claims to be an angel. Shadow Walker — (2009) Publisher: Sarah Rivera has a lot going on in her life right now. It’s bad enough that she’s being shipped off to Temt Tchaas Academy also known as Neteru Academy, a high school for future Guardians of the Light who have special powers, but she has to go there with her cocky twin brother and the rest of her compound brothers and sisters. To make matters worse, everyone has ridiculous expectations of her all because her parents are like supernatural rock stars for saving the planet sixteen years ago. But what nobody, not even her best girlfriend Tami seems to be getting is the fact that, Sarah doesn’t think she’s special, doesn’t want to be a demon-hunting hero, and is even afraid of the dark! So what that her mother was a Warrior Angel and her Dad used to be a Hell Council-level Vampire? Opposites attract. Go figure. As far as Sarah is concerned, all she got from the combination was a pair of fangs that lengthen at inappropriate times to embarrass her in front of her secret crush; whereas her brother, Alejandro, got the good looks and cool wings. However, what her parents’ status has created is drama in her life by ensuring that the mean girls at school will make her life a living nightmare. Sarah knows her family’s renowned slayer reputation will also ensure that everyone at school will assume she had it easy and should be able to do everything her famous rebel parents can do, when the heartbreaking truth is, she cant. Not by a long shot. Once at the hidden boarding school in the Appalachian Mountains, things go from bad to worse as Sarah tries to fit in. Her nightmares increase and it isn’t just anxiety; her second sight is suddenly developing at a record pace. Layers of secrets are held in the building, held by her parents, and nothing is as it seems. There is something really bad going on at the school, worse than bad — deadly. Only, faculty and administrators don’t know where to begin to look for the cause as students start to disappear. Sarah must then make a choice to stand on the sidelines or to help use her gifts to save someone dear. But to do that means facing all of her greatest fears, along with a demon or two.